Instagram is a great place to gain exposure for all business people. From home business to top branded business, every marketer concentrates on maintaining an Instagram account. Each day about 500 million active users are present on Instagram. Being a highly concentrated, visual platform for marketing, Instagram is a medium to grow business and develop a loyal audience. This social media platform also has certain ways to utilize it. 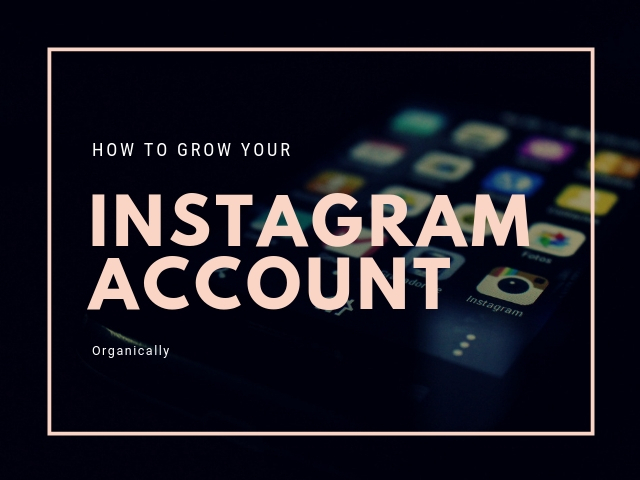 Let’s run through a few points and get to know tips about how to grow the Instagram account. Many users have the mindset to pick quirky and creative names to lure in more users. But such aspects would only make your blog interesting and are not associated with the Instagram name. Hence using a good Instagram name would be perfect and it would represent the followers about your account. For example, if your account is about raw food or lifestyle brand, do add the same to your Instagram name. The other beneficial reason for adding the Instagram name with service name is that it is easily searchable. By this way, more followers can find you. The main intention of using a hashtag is to get in touch with audiences that are not following. Making use of appropriate hashtag would get you linked to the right audience. For example, if you are writing content for FIFA, make sure to use a hashtag such as #FIFA, #FIFAworldcup etc. instead of #sports. When your content is related to events, make sure to use variants with the same source. The hashtags are highly in trend today and people are hunting for hashtags to find posts. Before getting started with hashtags, it would be a piece of good advice to look for the search volume. This is because there are many search volumes that go high into millions and you may get lost within posts. Hashtags that offer your posts with more engagement are the ones that should be employed. Per post about 30 hashtags can be used on Instagram. It would be advised to use 9 hashtags in a post. Creative contents are ones that can get you a lot of followers. When your content is creative and excellent, automatically likes and comments flow in for your posts. All of us are aware that Instagram is all about astounding visuals. It is hence advisable to frame best photos with tremendous colors. Apart from products and promotions, users can create stories too. Every account has a human behind it and people would like to see it. Apart from the pictures and screen, humans get linked naturally to humans only. Also bundle deals for social media can also be used. While planning to draft your bio, dedicate time to represent the person and people behind the account instead of just your business. Being a platform for photo sharing, Instagram has now gone beyond and has been sharing videos, stories as well as live videos. Brands have the opportunity to create various types of contents so that fans are linked and the account grows. There are a few reasons to post the above-mentioned categories. It is evident that the engagement for videos is more than photos. Stories feed is where you land when you are living on Instagram. Instagram stories are famed and are used by about 400 million users every day. About 57% of brands these days believe in stories as they are an effective strategy. Apart from hashtags, it is also important to pay attention to filters to be used on Instagram. There are few photo filters that are favored by others and these filters can increase your engagement rate. The most famed filters are Clarendon, Amaro, Juno, Lo-fi, Lark, X-Pro II, Ludwig, Valencia, and Gingham. To elevate your Instagram outreach, it is mandatory to post at the right intervals. This was proved by a study conducted in 2017 by Tailwinds visual marketing tool. They took time for about three months and analyzed about 100000 Instagram posts. It was found from the study that engagement rates rose for users who posted frequently. This also increased the follower growth rate. Hence posting every day can be a great way to gain engagement rates. By concentrating on your competitor’s account, you can gain a new set of followers. For this to be implemented, you need to get linked with their audience. These people like your product as they are following your opponent. Get engaged with your competitor’s followers by following them. To get engaged with a follower, you need to follow any user, like, as well as comment on the photo. Get to others account, run through a few photos and like it. By this way, your name is revealed and hence users get to know you. This technic can be followed for users in your niche. A simple way can be to check your preferred Instagrammers account and by searching through hashtags. Collaborating with others is one of the best ways to enhance your Instagram reach and enlarge your followers. This can be achieved by means of sponsorships or partnerships. This can be done by brands by taking over each other’s stories as a partnership. This partnership would pave the way to offer value to both the audiences and get in touch with a new audience. Another way for social media sponsorship is by employing influencer marketing. A good example of sponsorship is Daniel Wellington, a Swedish watchmaker who was able to develop followers to about 2.1 million from 850,000 just by sponsoring Instagram influencer in one year. The audience can take part in content creation rather than just reading any provided content. By this way, there are chances for the Instagram account to grow. It is good that the followers are encouraged to develop GIF’s, videos as well as photos associated with your product. Also, a branded hashtag can be developed so that the user-generated content is showcased. This is a method to elevate brand awareness and obtaining more content too. By this way, followers are also advertisers in this scenario. A clear example is that by generating user-generated content, there was about a 400% increase in buffer’s Instagram account. The main motive to be followed while creating content is that it should be one that people would love. It is advised to create content that is perfect not in an individual manner but also in a grid format. The complete Instagram page should possess good thoughts as in every post. Make sure to pick an appealing grid layout so that followers are attracted and stay on the page for a longer time. Posting enhanced quality content is one way to grow Instagram. The content you post should be one that your followers love and engage with. To get to know what your followers like, Instagram insights can be used. This feature lets you know most of your followers’ choice. To use this feature you need to tap on the profile picture, Instagram insights icon is to be tapped, click on “post” section and view “see more”. The top posts can be found out, also filters can be altered by sentence modification on the top. By this way, you can get to know raised engagement and impression on selected images, try to post that kind of images for more likes and engagement. Organizing contests and providing freebies is one way to develop your Instagram account. The real motivating aspect for users is getting free things and they engage more. Contest ideas are to be developed in a creative manner. The other manner is to develop a hashtag and offer them with a particular theme so that they could post. Such strategies were used by many brands and paved the way for growing their Instagram account. Responding to comments on your own photos is mandatory to increase engagement and grow Instagram. There are many followers who leave a good comment, it is now your duty to take time and respond to the follower by appreciating the follower. There may also be queries, from followers, do take time and answer them with patience. To edit as well as elevate your photography to the best quality Lightroom can be used. It is a free app and can be downloaded in mobiles too. Lightroom presence can be obtained from professional photographers as it helps your Instagram posts look astounding. Many followers can be obtained by using this feature. There are about 1 to 2 filters that can be used for every photo. Your editing time is saved and all your pictures look great. Location tagging is a method to discover the Instagram stories and posts about where the picture was taken or the present city. The location has its own story as well as feed. This can also be executed by making use of location sticker. Location tag is beneficial for local business as they can post in a regular manner and can also engage with followers in the location. You may like many photos in your niche and gain followers, but remember that leaving comments would be very effective. Look for pictures as well as accounts that hold similar hashtags and post a kind and friendly comment. A thumbs up symbol or a heart emoji may not get you much consideration but posting a comment would represent that you have read and gone through the complete story. Though this aspect may be time-consuming, it would lead you a long way. So never forget to comment photos in your niche and you can find many followers rushing in. Getting linked with Instagram pod is the best way to enhance your comment part of Instagram. People looking for sincere interaction can be found in comment pod. Schedules would be posted in this pod and people would leave comments on respective posts. The beneficial aspect of comment pod is that visibility is increased. Collaborating with the right influencer is a great way to grow Instagram account quickly. Get linked to the best influencer in your niche who holds vast followers. When your post is featured on their page, you can gain visibility of their followers. It would be great if influencers try your brand or product and they post them. When you’re tagged on their posts, then great things would happen. Also discount coupons and promo codes can be offered so that they post in the caption. This would help influencers to navigate followers to your site or account. Instagram is a perfect place for marketers. Creating an account and just posting would never gain you, followers. You must plan and follow the various strategies mentioned above. These tips and tricks mentioned above would be beneficial to grab in many followers. Every strategy can be executed in the account and checked. As you follow and post regularly, followers would automatically reach your account. Creative content is necessary to be posted along with perfect hashtags, filters, bio, etc. There are many sites that mention ample tips about growing Instagram account. Run through the sites and employ all the strategies to gain many followers on Instagram. The business of any type can use this platform in the right way and reach millions of customers globally. There is no other way for such a massive reach. Hence utilizing Instagram is the right way that can help you grow your account and reap success.